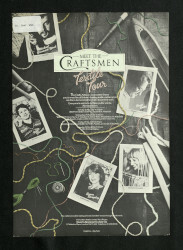 Informational leaflet and insert to accompany the Crafts Advisory Committee's 'Meet the Craftsmen: Textile Tour', May 1979. The leaflet includes biographical information for four of the five makers involved in the tour: Roger Oates, Susan Rangely, Michael Brennand-Wood and Geraldine Hubbard. 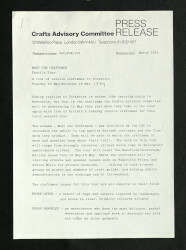 Information relating to the fifth maker, Kaffe Fassett, is printed on an A5 insert. The leaflet folds into four A5 panels and features graphics by Ray Kyte. A sticker bearing the library reference number is attached to the top left corner of the front of the leaflet leaflet and a barcode sticker is attached to the top left corner of the back of the leaflet.